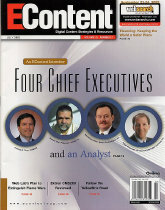 EContent's article in 2002 covered four CEOs' and their keys to success in building their companies when the Internet was challenging all content companies. Terry was one of those CEOs covered when he was CEO of COMTEX News Network, where he grew the business from $3 million to over $16 million and 20 consecutive profitable quarters. Do Your Sales People Act Like Mercenaries and PrimaDonnas?